Green tea powder – also known as Matcha – is traditionally used in the Japanese tea ceremony and a popular sweets ingredient in Japan now. This is a chilled dessert custard that has rich and mildly bitter green tea flavour and creamy in texture. The beautiful natural green colour and the scent of Matcha make me calm. 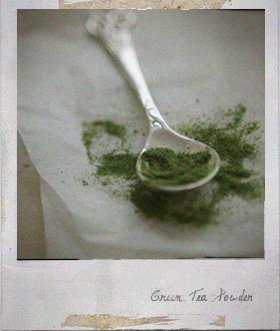 Mix the green tea powder with 3 tablespoons of warm water until dissolved. Set aside. Place the milk, single cream in a small saucepan oven medium heat until just comes to the boil. Add the dissolved green tea and mix. Place the eggs, egg york and sugar in a bowl and mix until well combined. Gradually add the milk mixture, mix to combine. Strain the mixture through a fine-meshed strainer and pour into the cups. Place in a deep baking dish and pour in enough hot water. Remove from the baking dish and refrigerate until cool. 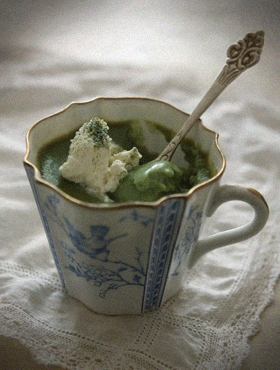 Serve topped with the whipped cream and green tea powder if desired. You are currently reading Green Tea Pudding at Fish Trip Cafe.